I was looking out my cousin's bedroom window when I saw my first ghost. At first I thought it was just someone walking around the cemetery at night until I realized that this person was all blue and kind of glowing. This made me a believer in the paranormal. 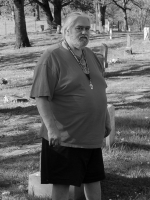 I joined West Coast Paranormal Squad to help prove to others that the paranormal does exist. My personal goal is to help people understand that bumps in the night are not always something bad. That not all ghosts or spirits are mean, evil entities bent on destroying peoples lives.